Wow! I could really use this for groceries and extras this week! Thanks for the giveaway. I would be excited to be a winner! best giveaway of the week!!!!! already like you on fb!!!!!!! Love your weekend giveaways! Thanks for the chance! Love the creepy crawly card! Good Luck to all! Good Luck everyone in winning a great looking card! love your site. Thanks for the giveaway. Such a fun giftcard; thanks for the opportunity to win each week. Hope I win. This is great! I like you on face book – and thank you for all you do! I liked totally Taget! I would love to win! I would love to win – thanks for the opportunity! 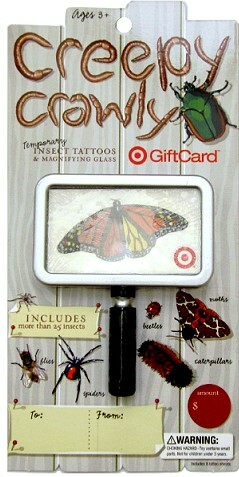 I love shopping at Target and my kids would love the bug tattoos! Cute gift card 🙂 I want spring so bad, I’m even calling bugs cute! Love Totally Target !!! WOW! My son would love this! Thanks for the chance. this one’s icky, but my daughter would love it! I love following you each week!!! One of my first stops everyday when I get home from work – LOVE totallytarget!